aww, sad :< who is it for? 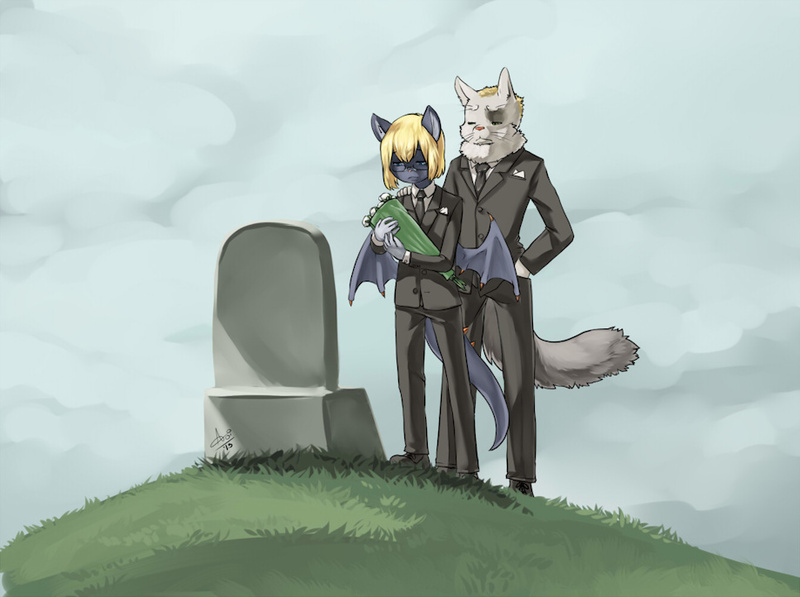 Well, it´s not actually a funeral. His mom died six years ago. Since then he always lays down a bouquet of white roses on the grave on her birthday. y does this remind me of Metal Gear Solid? Without context, this and the previous pic go surprisingly well together. And look at that! Some jerk graffitied their signature on the tombstone! I was observing a moment of silence for the lost. This only reminds me to visit my father's grave when I can. Scrooge's father Fergus: "Coom along, Scroogey! Let's get your cart up t' the castle so ye can rest oop!" Scrooge: "Okay, pa...but drop me off on the way so I can visit ma." 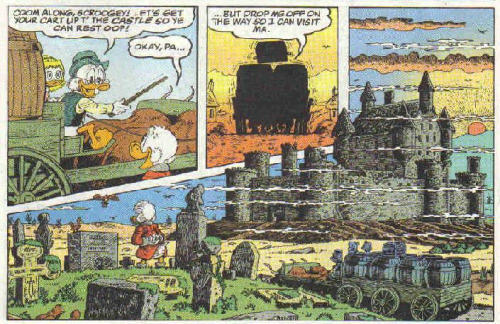 Rosa did a second version of old Scrooge as we know him visiting the same grave (now with his father also in the ground) in the 1950s, as he's visiting Castle McDuck again with Donald and the nephews to find the lost treasures of the Knights Templars that in the 1300s upon the seizure of all the order's continental holdings by the Pope and the French king were entrusted to the clan MacDuich that centuries later would anglicize their name as McDuck. You see, there ain't just one "creator" to all the comics and cartoons. "Disney" really means an industry comparable to the superhero franchises. As for the comics, Scrooge was originally created by Carl Barks who drew for Disney from the early 1940s to the mid-1960s and also single-handedly invented Duckburg: https://en.wikipedia.org/wiki/Carl_Barks Barks is recognized as "the good artist", "The Duck Man", and one of 20th century's greatest storytellers in any medium. And the cartoons were created by a whole bunch of people working at Disney's where nobody ever stood out as much as an international star as did and do Barks and Rosa, be it the 1930s-1950s shorts, the 1950s-1960s TV specials, or the 1987-1990 Ducktails series.